A good Facebook campaign can be used to accomplish almost every marketing goal you have, including introducing your brand to new audience members and driving in-store traffic with one-per-customer coupons. It’s an exceptional system that feels like a blank canvas, waiting for you to do anything you’d like with it. It’s a blank canvas, and there are so many options that you don’t really know where to start. It’s like being told you can do “everything” as an English major in college. Sure, you could potentially do “everything,” but with no plan and experience in other fields, you also can’t really do anything. Too many blog posts like to dish out abstract theories instead of actual, detailed instructions for how to see them through, so too many people don’t know how to move forward with creating a solid Facebook campaign. We wanted to change that. In this post, I’m going to share with you six different actual Facebook campaign strategies that you can use to build brand awareness, get conversions and connect with the audiences you’re targeting. 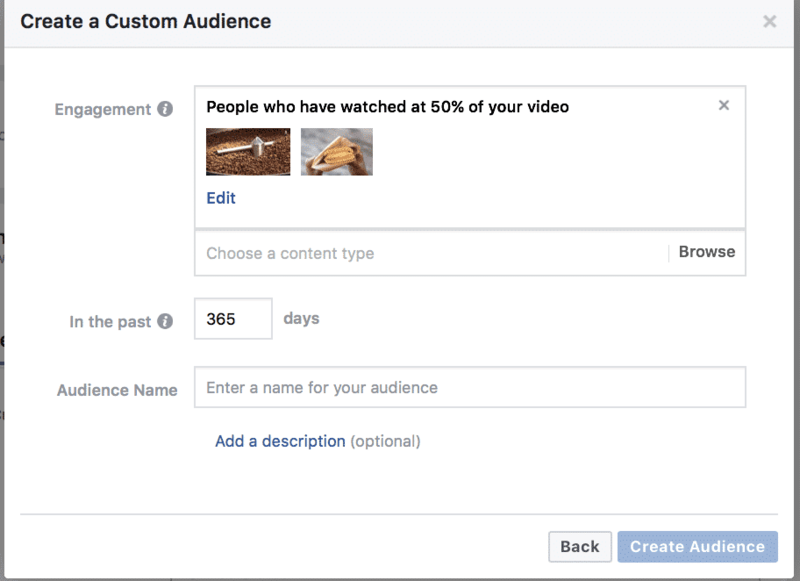 Is a brand new user going to convert the very first time they’re introduced to your brand through a Facebook Ad? At least 90% of the time, the answer to that question will be a resounding no. Personally, I’ve typically needed to see ads from a single brand at least three times before I click. Even if I’m only seeing the same ad, I subconsciously trust it more just because I’m more familiar with it. The boomerang strategy is a great solution to this problem. With this strategy, you’ll show cold users an initial ad designed to introduce them to your brand and explain what you have to offer. These users should be new to your brand, but the targeting is up to you—both lookalike audiences and basic demographic targeting can work fine. 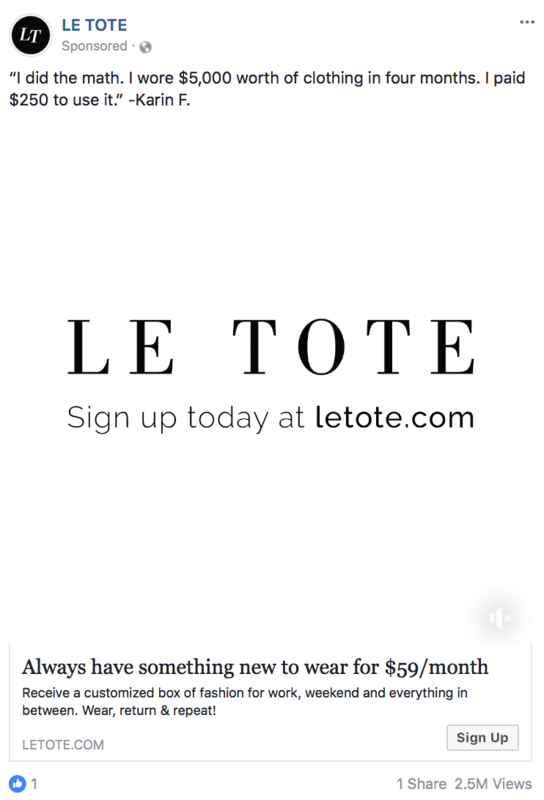 After this ad runs for several days or a week, you’ll create a second campaign that retargets users who engaged with the first. This second ad may include an offer or a lead ad that pushes users a little further in the sales funnel. It’s common to use a video ad for that introductory ad, with the objective being to get as many video views as possible. Next, choose “Video Ad,” and then select which videos you want to use and which viewers you want to target (based on the amount of video they watched). This is a pretty common strategy, but a lot of small businesses are unaware of it so we’re still going to cover it. Most advertisers know that you can create custom audiences based on your own customer list and/or email subscribers. You can create segmented audiences based on different customer activity. A computer repair store, for example, could create an audience off those who purchase your computer repair services, but not the laptop accessories you sell. Or, they could create custom audiences based on their high-value customers, who spend more than $1400 with them a year. Going in, you know a lot about these specific customers and how they interact with your brand. Use that to your advantage when trying to target cold audiences by creating a lookalike audience of these high-value customers. You’ll have a strong idea of what types of ad content that they’ll be responsive to and how they’ll use your product. You can even test ads on the original custom audience you based it off of. Facebook’s exceptional retargeting capabilities—as we just discussed—make it my personal favorite ad system to use. This includes their website retargeting option, which is phenomenal. With this feature, you can run retargeting campaigns to users who have interacted with certain pages, including creating ads specifically for users who added something to their cart but didn’t convert. 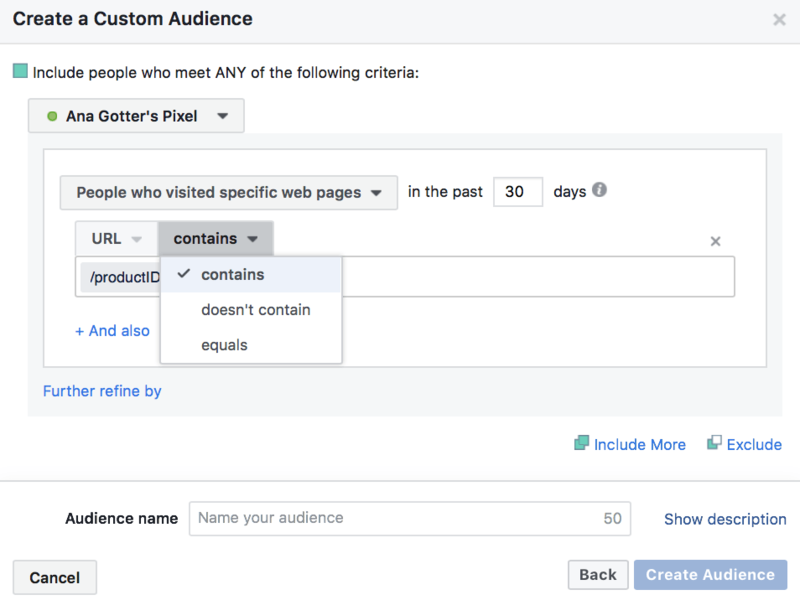 Build your custom audiences from website activity and choose users who engaged with certain pages. You can also exclude users who recently purchased by eliminating the “thank you for your purchase” page from the targeting. Similarly, you can only target these users encouraging a repeat purchase. For brands with large catalogues, setting up dynamic product ads and running them based on retargeting is an excellent strategy. If users clicked to look at that product, they’re almost certainly interested. They may still be in a research phase, or “just thinking it over” (aka justifying spending the cash on it). Prodding them with ads showing them the exact product or service they were looking at can be enough to win them over. When you boost posts on Facebook (as opposed to going through the full Create An Ad process), your targeting options are a lot more limited. 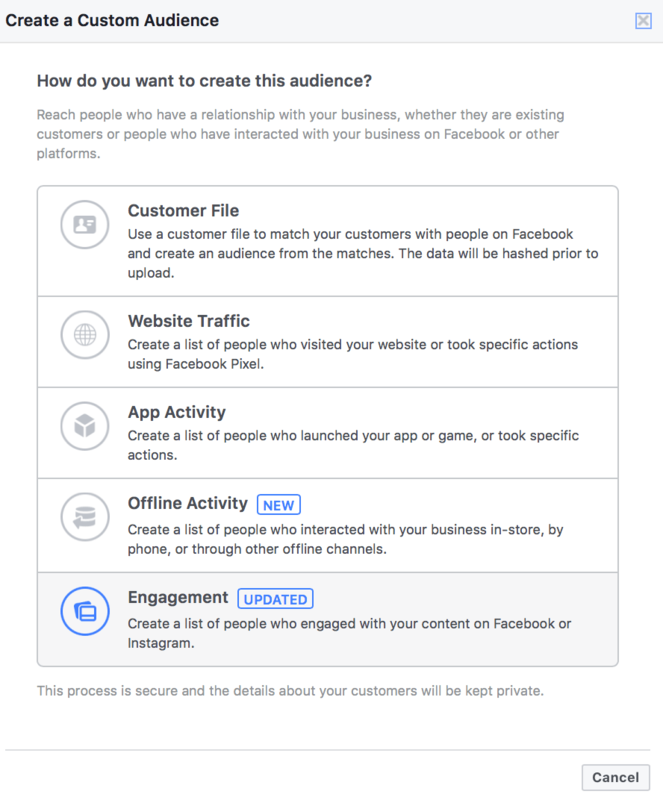 This is intentional on Facebook’s part, because it’s meant to be a simpler, less-intimidating version of the ad system for people who don’t want to take the time to learn it. I like to use boosted post campaigns to promote events that are listed on Facebook. It’s quick and it’s easy. When I do this, in many cases, I’ll sometimes choose to target people who are already connected to the Page and their friends in at least one campaign. This has a few distinct benefits. The people you’re already connected to will be most excited and you want to make sure they know about the event. They’re most likely to engage and attend. Including their friends, though, takes this an extra step further and gives you access to an additional network of people that may be interested—they may have even heard their friends talk about you before. I’ve run several campaigns like this and seen comments like “Hey Jessica, isn’t this that place you’re always raving about? Let’s go to this!” on almost every single one. This one is really simple. 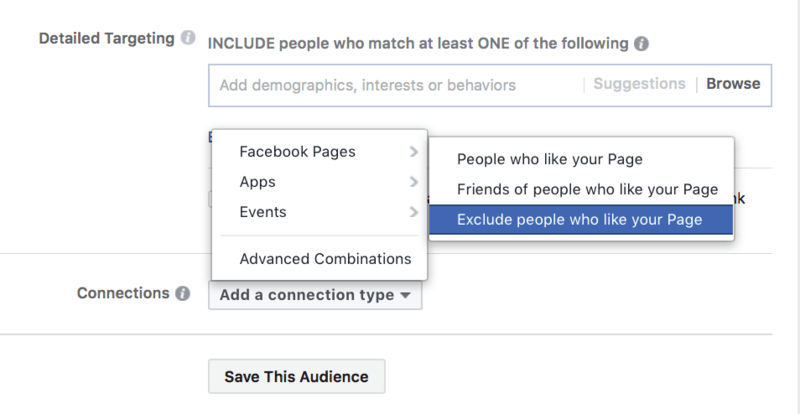 If you’re actively trying to reach new audience members exclusively so you don’t waste ad spend, you can choose to only show your ads to people who are not yet connected to your Page. Sometimes, though, it can be good to have current or past customers weigh in on how awesome your brand is on that ad. New viewers, after all, don’t know you and don’t trust you. To counteract this with cold audiences, I like to run campaigns under the Engagement objective that promote high-performing posts. When you promote existing posts, ad viewers will be able to see all the incredible comments left by past users raving over you. I’m specific about the posts that I choose and try to choose one that advertises the product well and has a ton of great user comments from enthusiastic customers. When I explain it to clients, I refer to it as putting your best foot forward—now new viewers don’t even have to do off-site research to know your customers love you. New customer acquisition costs are expensive but necessary. Sometimes, though, we spend so much time chasing after new customers that we forget about the ones we had who have dropped off. Reengagement campaigns designed to reel those long-lost customers back in can help you maintain and grow a client base. To make things even better, they are often more affordable than getting new customers. You only have to one run campaign here, after all, instead of two. Most businesses use CRM software or email lists that may provide you with customers who haven’t purchased or engaged with your brand in awhile. Maybe they haven’t purchased, or maybe they’ve been ignoring your emails. In many cases, these instances may go hand-in-hand. 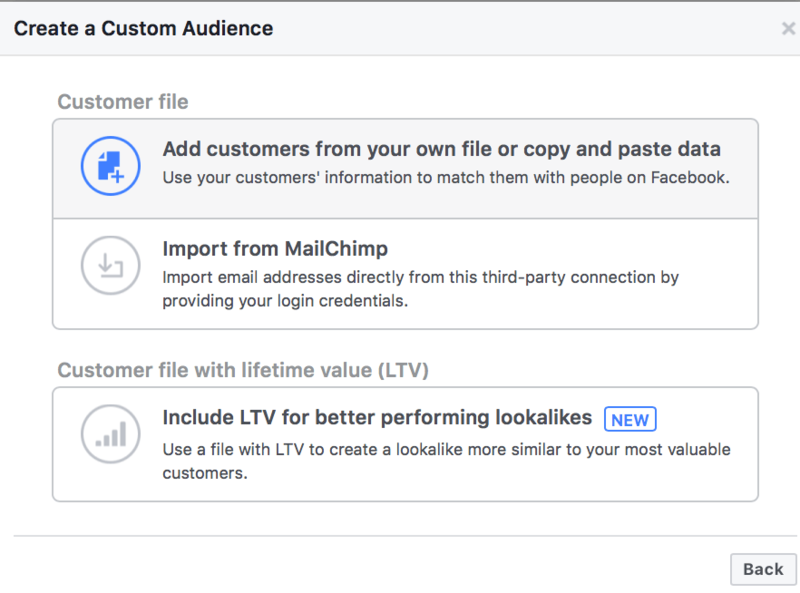 Download that list of users, and upload it to a custom audience on Facebook. To do this, create a custom audience with the “Customer File” option, and then add customers through your own file. You can see how to format these files here. Show these users an ad that offers a powerful incentive for them to come back and purchase. Discounts and exclusive offers can be a great way to go. You can also use segmented audiences to show them products similar to what they’ve purchased in the past. Using a headline like “We miss you, come back!” can also help. 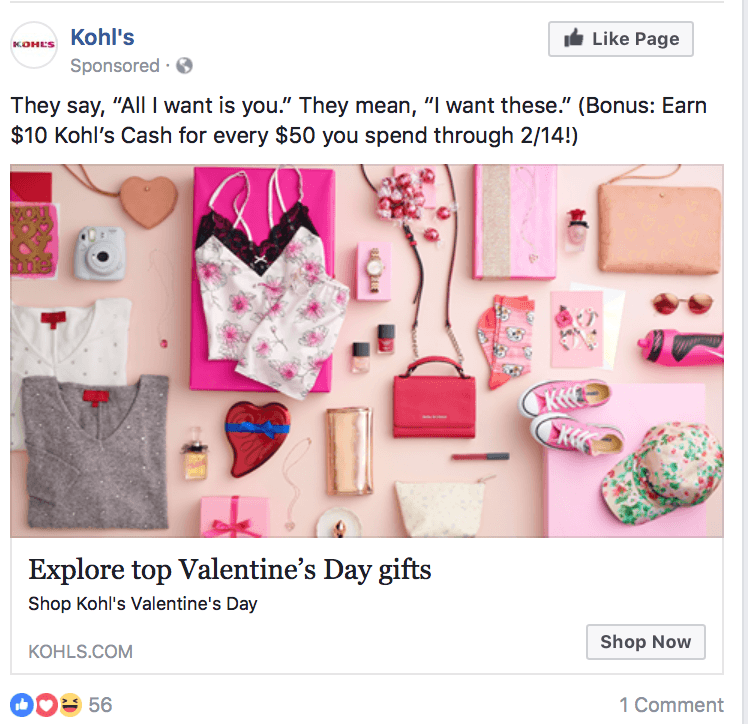 If I go several months without shopping at Kohl’s, for example, I’ll start seeing ads reminding me about Kohl’s cash. As a side note, you should watch engagement on these campaigns very carefully. Some users may have abandoned ship because their budgets got tight or the competition was a little cheaper. Some, though, may have had a negative experience, so you’ll want to watch carefully for negative or hostile comments on the ad that could dissuade other users from buying again. 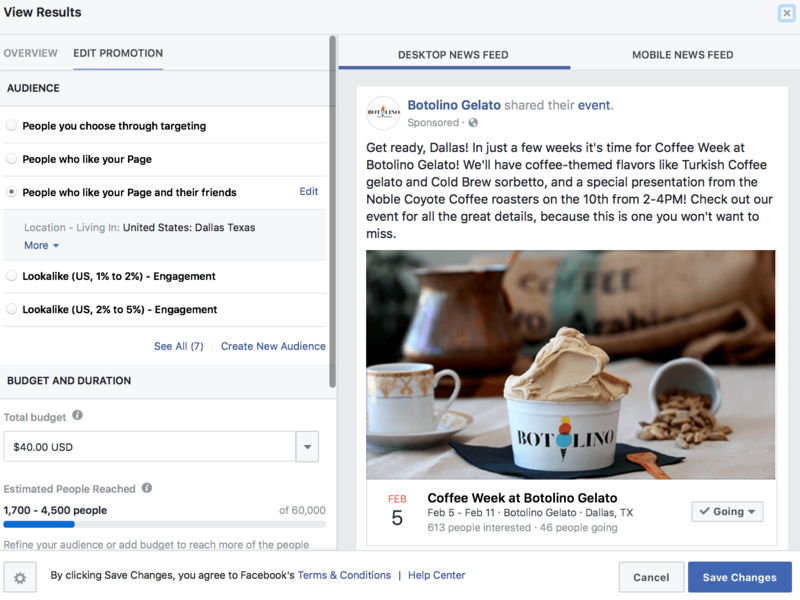 Facebook Ads and Instagram Ads can truly connect you with users at all stages of the buyer’s journey. It can even work if they’ve already bought from you several times before. 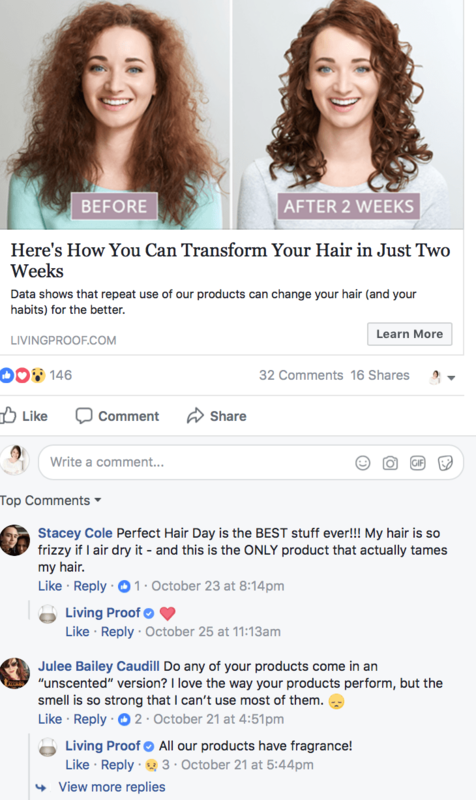 Use these six detailed, powerful Facebook Ad strategies to create ads that are incredibly focused and incredibly successful. By the way, if you’d like help putting together a Facebook campaign using any of these strategies, let me know here or in the comments. I’d love to help! What do you think? 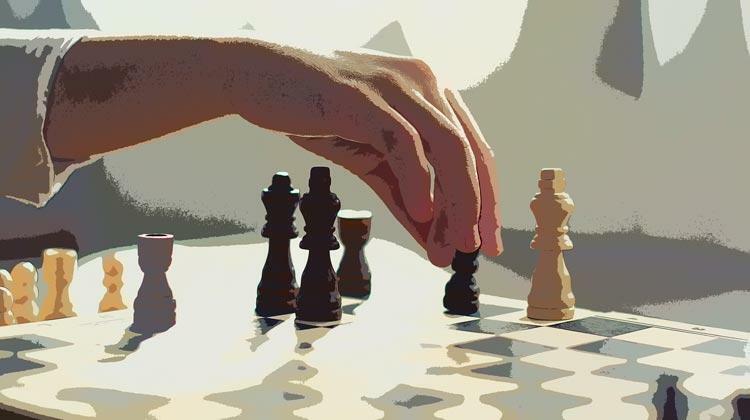 Have you used any of these strategies before? Which ones get you your best results? Share your thoughts and questions in the comments below!